A 10th order 3.1 kHz input low pass filter in the 'Invert' path. A balanced modulator providing fixed frequency inversion (3.3 kHz) and having high baseband and carrier rejection. A 14th order bandpass filter (300Hz to 3 kHz). Input Op-Amps in both 'Clear' and 'Invert' paths allowing external components to set input gains, and pre-emphasis or de-emphasis in the 'Clear' path. Clear/ Invert switching causing automatic changeover of signal routes and input circuitry. A buffered low noise output with switching clock filter. An Output Enable switching facility. Both filter sets meet the Net-C specification and use switched capacitor technology. 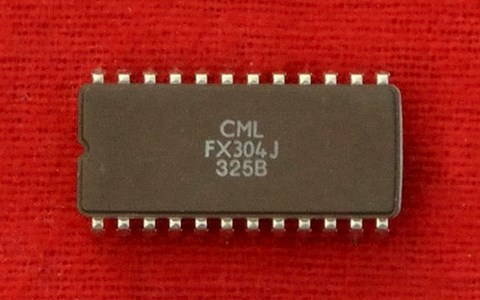 The common carrier frequency and filter switching clock are generated on-chip using an external 4.433619MHz Xtal or clock input.